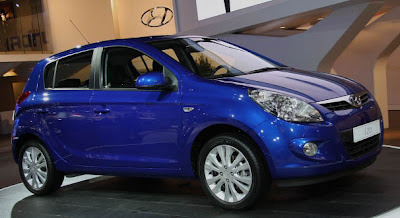 Hyundai Motor Launches its stylish model – the i20, a premium compact car for India to begin with. Its a significant addition to the new generation of Hyundai vehicles identified by the i prefix. Hyundai i20 will be available in three variants Magna (Rs. 479,900), Asta (Rs. 5, 59,900) and Asta (O) (Rs. 581,900)-all ex-showroom prices, Delhi. The company firmly believes all the three car are set to re-define the segment and set a new benchmark for this class of cars. The new Hyundai i20 arrives with a palette of 7 new solid and metallic exterior hues – including the fashionable Crystal White. Focused on being fuel-efficient, the Hyundai i20 comes with a 1.2 litre, Kappa, DOHC petrol engine with a max power of 80PS@5200 rpm and a peak torque of 11.4 kgm@ 4000 rpm. The proven and reliable Kappa engine provides class leading performance and offers the maximum power for any car in this segment. The engine is mated to a 5-speed manual transmission. The new i20 is Euro V ready and meets all the existing emission norms. Similar to its predecessor the i10, the i20 will be manufactured exclusively in India at Hyundai Motor India's Chennai plant.